Ferris Bueller is an American sitcom based on the 1986 John Hughes film Ferris Bueller's Day Off. The show stars Charlie Schlatter in the title role. The series debuted on August 23, 1990, on NBC and was cancelled within its first season, a few months after its debut. The show was produced by Paramount Television. Hughes was not involved in the show's production. Though based on the film, the series was not a canon continuation, rather it was set up to portray itself as being the "real life" situations upon which the film was loosely based. 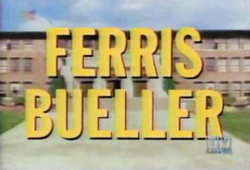 In the pilot episode, Ferris (Schlatter) refers to the film and expresses his displeasure at Matthew Broderick portraying him, even going as far as destroying a life-size cardboard cutout of Broderick with a chainsaw. However no further references to the film within the series' continuity would be made after this. As in the film, the series focused on Ferris Bueller and his high school experiences at Ocean Park High, including dealing with his best friend Cameron (Brandon Douglas), love interest Sloan (Ami Dolenz), and sister Jeannie (Jennifer Aniston). Although the film was set in Chicago, the series was set in Santa Monica. Like the film, Ferris is liked by everyone as the "cool guy on campus." He is extremely popular, suave, quick witted and a master of ceremonies who often breaks the fourth wall. Cameron is still a depressive neurotic who, through Ferris, is able to loosen up occasionally. Sloan is portrayed slightly different in that she is not completely wrapped around Ferris' finger and has to be won over at times. Ed Rooney is the primary antagonist and always out to get Ferris but usually ends up foiled or humiliated. His secretary, Grace, is not a wise-cracking sarcastic, but a passive pushover with an unreciprocated crush on Ed. Jeannie is constantly at odds with Ferris and his being favored by all. Though she can be antagonistic, she has proven not all bad, albeit begrudgingly. In the film, Mr. and Mrs. Bueller's names are Katie and Tom but in the series they are Barbara and Bob, as well as Ferris being a junior and Jeannie being a senior as opposed to the other way around in the movie. The first day of Ferris Bueller's junior year begins at Ocean Bay High School. He has some old issues to deal with such as his arch nemesis Principal Rooney. That will have to wait as he has the new issue of a beautiful transfer student named Sloan. Principal Rooney handpicks a candidate for student-body president and prohibits Ferris from running. Ferris does the next best thing and prepares his own candidate. His choice is a boy named Shred who dislikes Principal Rooney as much as he does. Ferris and Sloan have hit a bump in the road in their new relationship. Ferris makes the mistake of being unsupportive of Sloan's ambition of becoming a dancer. Ferris is also at odds again with Principal Rooney as he convinces Lou, the new janitor, to impersonate the new dean of students, a former Marine drill Sergeant. Cameron feels trapped in Ferris's shadow. Ferris attempt to help his friend by suggesting to him that he should do something he will be remembered for. Cameron takes his advice by pulling a dangerous stunt. Sloan wants to throw a small and peaceful surprise party for Cameron's birthday. Ferris has other plans and they include lots of people, a rapper and Principal Rooney's house. Ferris is still trying to win Sloan's love so when she asks him to watch the school mascot he agrees. Principal Rooney sees the dog with Ferris and gets rid of it by calling the dogcatcher. The San Diego Chicken makes an appearance at Ocean Bay High School, which kicks off a run of bad luck for Ferris. He gets in a fight with Sloan and Cameron accidentally destroys his homework. To top i t all off an earthquake hits while he is riding in an elevator with his archenemy Principal Rooney, trapping them both. Ferris and Jeannie set their differences aside and work together to ruin a date between Sloan and the new exchange student from Italy. Ferris wants Sloan back and Jeannie wants the exchange student for herself. Ferris' nosy, know-it-all grandmother wants to turn her two-week visit into a permanent stay, and gets a job as a counselor at his school. The father of Cameron's new girlfriend Ann forbids Cameron from seeing her. Ferris poses as her boyfriend to get past her father. Complications arise when Cameron's girlfriend falls for Ferris. Ferris gets the car of his dreams for his brithday, a 1962 Chevy Corvette. His dreams turn into nightmares when he and Cameron become concerned that the car is haunted. Ferris returns to talk to the car salesman, Mr. McFarland, and discovers that Mr. McFarland has been dead for over 20 years. Principal Rooney cancels "Beach Day" when he hears that Superintendent Weldon has planned an inspection. Ferris has been looking forward to the event and decides to secretly go ahead with the plans. Ferris and Cameron survive an eventful night while trying to churn out an important class paper. Compared to the film, the show received mostly negative reviews from critics. It also suffered from comparisons to not only the '80s film, but also another series, Parker Lewis Can't Lose; at the time that series initially proved to be more successful when it came to ratings, lasting for three seasons. Ratings for Ferris were strong at first, but declined in later episodes. 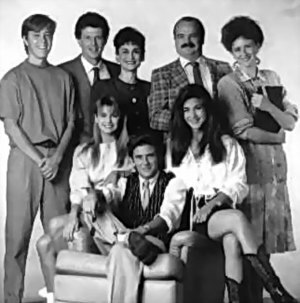 The series was cancelled due to poor viewership and low ratings after one season airing a total of thirteen episodes. ^ Company credits for Ferris Bueller on IMDb . Retrieved 2017-07-29. ^ Carter, Bill (December 17, 1990). "Hear About a Film That Became A Hit TV Series? You're Not Alone". The New York Times (online ed.). Retrieved 2017-07-29. ^ Shales, Tom (1990-08-23). "'Ferris Bueller's' Off Day; On NBC, a Lame Take on a Movie". Washington Post. Retrieved 2008-12-01. ^ Storm, Jonathan (1990-08-23). "High School Comedy Strictly Sophomoric In The NBC Version, 'Ferris Bueller' Has An Off Day". The Philadelphia Inquirer. ^ "Jennifer Aniston: Life and Career: 1990's CAREER". Jennifer Aniston. Retrieved 2018-05-31. ^ TV.com. "Ferris Bueller". TV.com. Retrieved 2018-05-31. ^ "Ferris Bueller - Television Obscurities". Television Obscurities. Retrieved 2018-05-31. This page is based on the Wikipedia article Ferris Bueller (TV series); it is used under the Creative Commons Attribution-ShareAlike 3.0 Unported License (CC-BY-SA). You may redistribute it, verbatim or modified, providing that you comply with the terms of the CC-BY-SA.